The sky was clear when 15 GTA gliders took off in marginal conditions after a cold front passed through on Thursday. 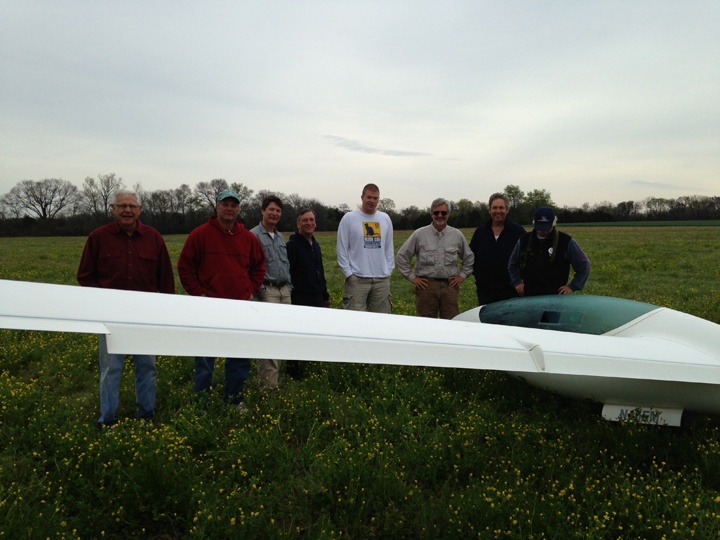 Gliders were with us from Michigan, Ohio, Georgia, Alabama, Memphis, and Knoxville as well as our Eagleville members. Two tow planes were available and got the fleet in the air in about an hour. A MAT was called but most could only get to about 3,500′ MSL with lift averaging about 2-3 knots. 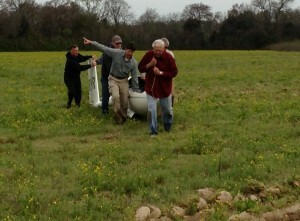 DB joined the group in the air and most of the group took off to the first turn point. Even with very weak conditions several completed the task and/or earned distance points. Bill Elliott was first; Francois Pin second; John Mittell third and Time Larsen fourth. Others landed out and earned distance points. 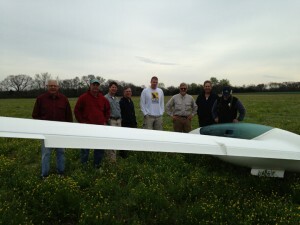 Two landed in an airport a mile from Puckett; another at a private strip nearby; Frank Paynter at an airport about 20 miles away and was able to get a ride from some RC folks to Puckett for a self retrieve; and the best (?!?!) out landing of all was by our club president, Cornfield Bob Richard (now known as Mudfield Bob) in a plowed field some 20 miles away. 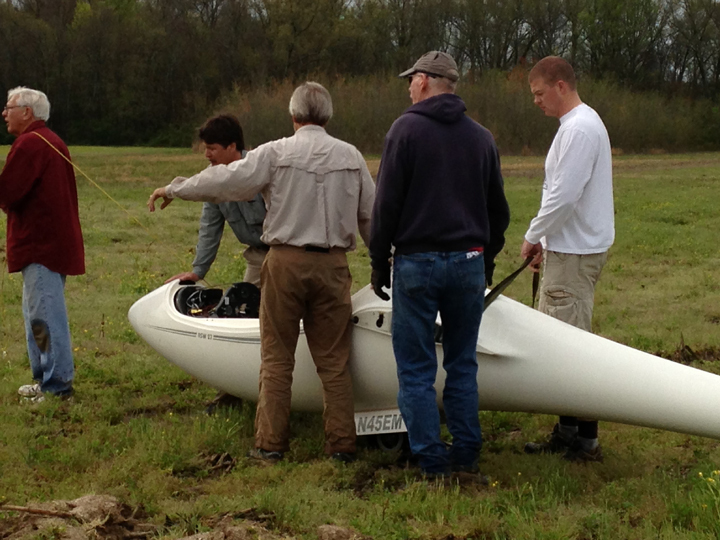 The adventure to get Mudfield Bob out of the field began on Saturday afternoon but had to wait for completion on Sunday morning while we had a terrific cook out at Puckett Field. There was plenty to eat with huge burgers, wild hog meat and venison harvested by Michael Poe and plenty of beer next to a good bonfire. 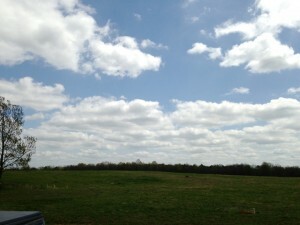 Several camped at the field and good conversation went on into the evening. 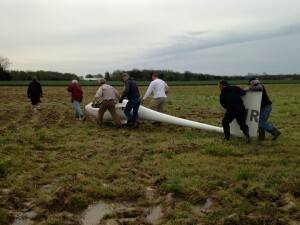 However a group agreed to meet at 7:30 am on Sunday to get Mudfield Bob’s plane out of the field. 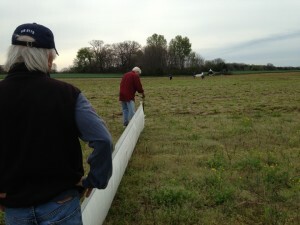 The story begins with Bob picking a dry section of the farm field for landing on Saturday. However getting to his ship required crossing a major mud area. First he got his car and trailer stuck in the mud. Then a farmer brought his tractor and got Bob’s car out and back to the road. Before he could get the trailer out the tractor got stuck in deep mud and it was decided to quit for the day while the farmer got a much larger four wheel dual wheel tractor to assist. When the group of nine arrived Sunday morning the small tractor was gone and the large one was standing by after getting Bob’s trailer out to the road. This is our view of Bob’s ship across the mud in the distance. The crew was full of energy to disassemble and carry the ship out. Still a ways to go! After the success of a completed retrieve we were off for a complimentary breakfast by Mudfield Bob. However as things can happen in the South most rural restaurants are closed on Sunday morning for church. So Mudfield Bob owes us all big time, sometime in the future. 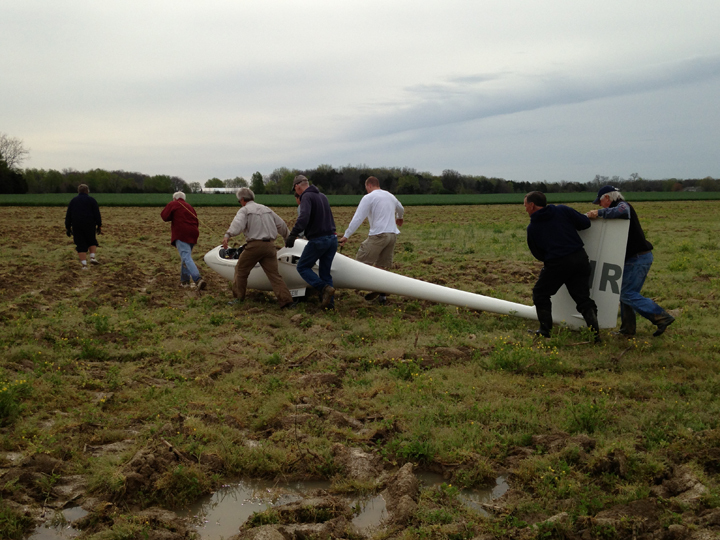 Sunday was not a good soaring day either. A high overcast and strong winds had everyone packing up but during the pilot’s meeting everyone agreed that we should have this GTA meeting the same time next year i.e. the weekend before Perry. Those that were traveling on to Perry said they would love to stop on the way again and enjoy the Eagleville Soaring Club’s hospitality. (So Chris Ruff please note). By the way, this is what the sky looked like today, Monday, 15 April 2013.
our right ! It must be a Monday, or a Tuesday , or a………………… ! 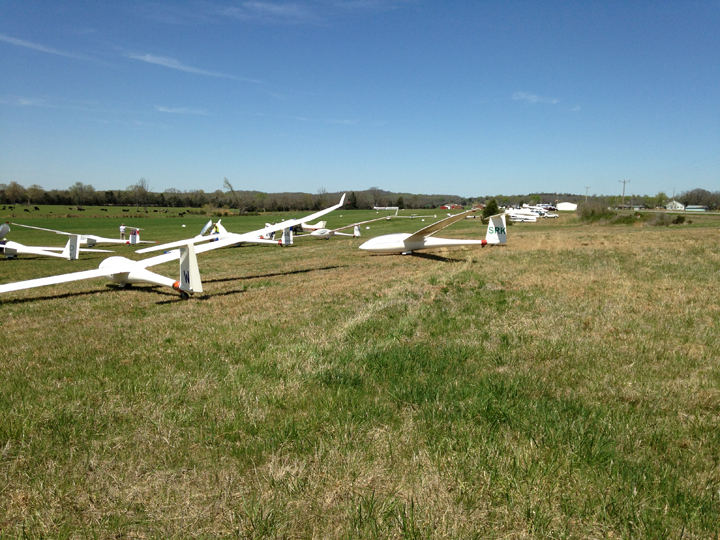 Thank you to all the Eagleville Soaring Club folks that made this weekend the enjoyable, safe and rewarding event that it was. Thank you to all the GTA folks that came to our soaring slice of the world. 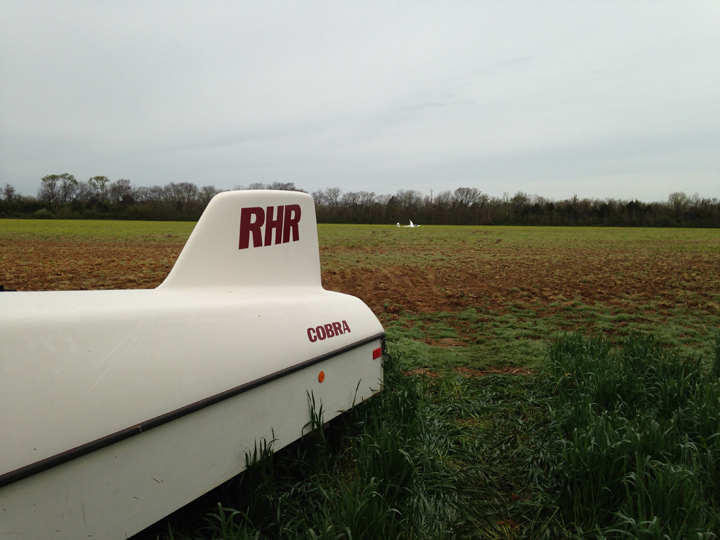 We have all known, for over 40 years, what a great place Eagleville is for soaring and flying camaraderie! GTA Race This Past Weekend at Eagleville! New Eagleville Soaring Website & Logo!